I wrote this code to find if a directed graph contains a loop or not. I am pretty new to graphs and I saw some examples on the internet but couldn't actually understand their implementations. So I read somewhere that you can colour mark the nodes. So this is my iterative implementation of that method. Is it an okay'ish' approach and how can I improve on it if it's correct? # If assert raises an error, then a test case was not passed. Lets first review your code, and then introduce you to one alternative on how to do unit tests in Python. I should have to guess that, and it should be written in a docstring related to the function. This applies for all similar coded segments where it is not intuitive what the variable, function or variable values means. Add blank lines to enhance readability – The common guidelines says two blank lines between functions, but I would like to extend that to have a blank line around most if, for and while blocks, and the occasional block of code. You've done this to some extent, but there are two places I really would like to do this and that after the while and for loop where you do an immmediate return statement, which now seems connected to the inner loop code. Avoid loose code at top level – In general only imports, constants, functions and classes are to be at the top level of your file. This makes it, amongst others, easy to use your file as a module, and it helps organise your code. In your code all of your tests are at the top level, and should have been within some test scope. I'll come back to this below. Another nice options, when entering the world of unit tests, is to execute the unit tests when you execute the python file directly, and then otherwise use the exposed functions, i.e. cycle_exists() and dfs(). Remove the visited list in dfs() – It seems like you've forgotten to remove the visited list in dfs(), as it isn't currently used for anything besides being initialised and added to. You don't do any checks against it. Similarily, remove black from the palette – In your current implementation you don't use the color black for anything, and as such it can be removed, which also would allow for a simpler dict, as the only thing you seem to be interested in is whether it has been visited or not. This can be achieved using a boolean. Add more error handling – Your code doesn't do much error handling or validation of input, which some like and some don't like. I think I would have added at least a test that the graph exists at some level. No need for the inner parentheses in dfs() when adding to stack – At least in my tests you can remove the inner set of parentheses, and no change happens. """Traverse the graph, and see if we come back to a earlier visited vertex.""" """Return whether the graph has cycles or not.""" One thing I haven't addressed if whether this is the most effective way to check for cycles. In fact I know it isn't as for each vertex we traverse the graph over and over again. Multiple options exists for doing unit tests in Python, and it comes down to personal preferences. Here I'll present you for the internal version, namely unittest, which suffices for this code. In your case the tests are rather simple, so I've done some according to this scheme, and for some I've taken a few shortcuts. But even though the tests are simple, do remember to let one test method only test one thing. It is considered an anti-pattern to have multiple actions or asserts in one method. Using unittest, I find that using a class name like test__function_to_test is a nice pattern, although not entirely according to guidelines. This should inherit from unittest.TestCase enabling us to easily run the tests using unittest.main(), which will run all tests functions starting with test_. self.assertFalse(has_cycle, "Didn't expect cycles for this one! Or did I?") # Dead wrong!!! """Helper class to test the detect_cycle function. AssertionError: Didn't expect cycles for this one! Or did I? Notice how the 'dots' have changed to include an F, and that the FAIL: line names that is was the test_confused_graph_result() in the test__cycle_exists class which has failed, and you get some details as to what failed. If the test is well written you should now easily see why it failed, and hopefully understand what went wrong. 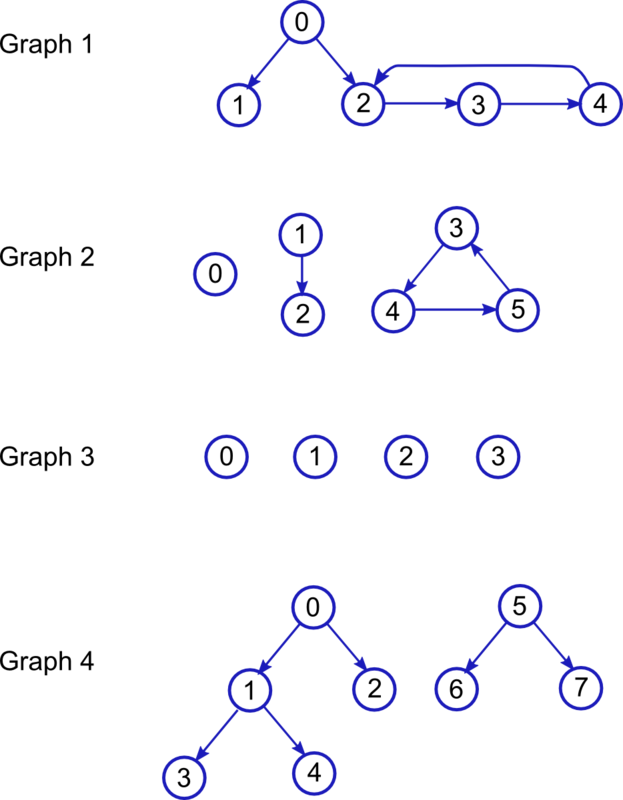 Algorithm is not correct for directed graphs, but it would work for undirected graphs. Consider a graph like one below. It is acyclic (DAG) but your code will detect a cycle. Test case here. The correct approach would be: Two dictionaries are needed, pre and post. When you start processing a vertex (just got to it) mark it in pre. After you finished processing a vertex (just processed its adjacents) mark it in post. 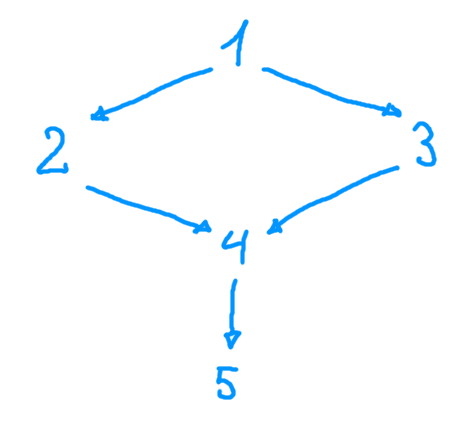 When processing adjacent vertices, if you find a vertex marked in pre but not marked in post, you found a cycle.